Istanbul, Turkey holds a special place in my heart, because of the generous hospitality that the locals offer, despite me being a stranger in this foreign land. The country straddles across two continents – Europe and Asia – hence its distinct and unique characteristic with both European and Asian influence. This is probably the very reason why a Euro-trip will not be complete without visiting Turkey – more specifically Istanbul and Cappadocia. If you’re looking for ideas on what to do in Istanbul, this article highlights a range Istanbul attractions that can include in your itinerary. A number 1 Istanbul attraction, the Blue Mosque is so called because of the blue tiles adorning the walls of its interior. It was built from 1609 to 1616, during the rule of Ahmed I. It is made of Ottoman and Islamic architecture. Do remember to dress modestly, as ladies are required to drape a scarf (provided at the entrance) over our heads when we enter the mosque. 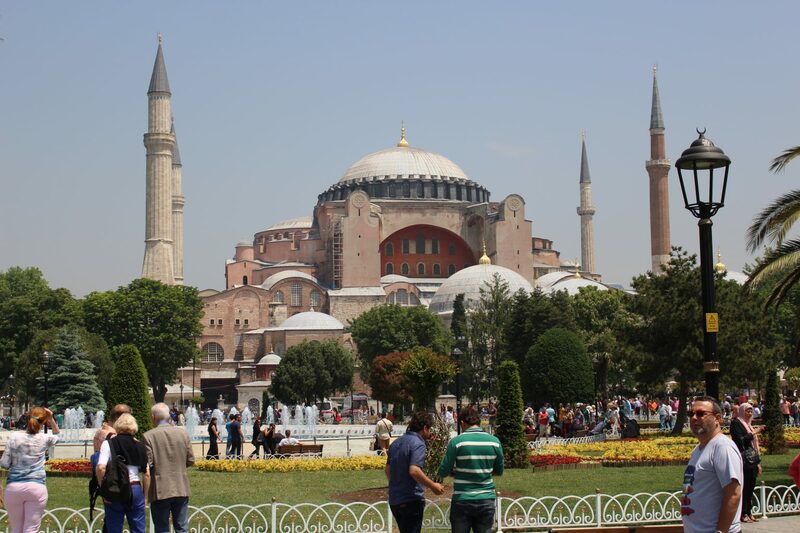 A trip to Istanbul is not complete without visiting the Hagia Sophia either. The Hagia Sophia is a former Christian patriarchal basilica, later an imperial mosque, and now a museum in Istanbul, Turkey. It’s inspired by the Byzantine architecture. Make sure you enter the premises! The sheer grandiosity of the Hagia Sophia is truly a sight to behold. I love the variety and vibrancy of what the shops in here have to offer. 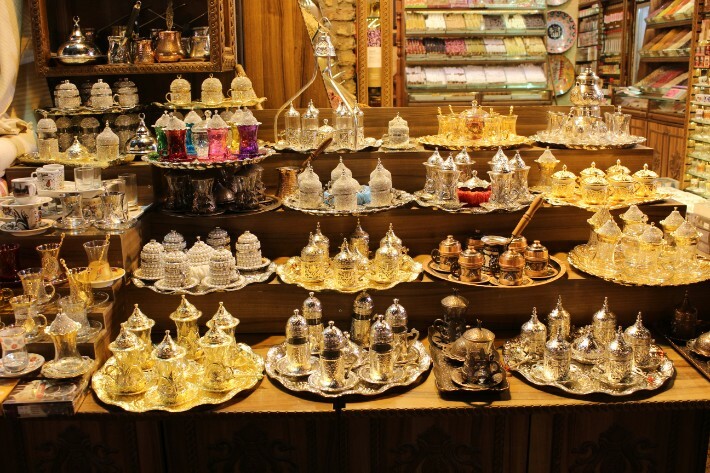 Interestingly, when we asked a shopkeeper to recommend a little coffee shop where we can sip Turkish tea and take a break from all the walking, she immediately phoned for the “tea boy” to bring 2 cups of tea over to her shop. We thought she’d misunderstood us, so we tried to explain again, that we wanted to buy tea from a coffee shop. Next thing we knew, she brought out her chairs for us to sit down to wait for the tea to arrive! So there we were, two Asian tourists, sitting by a jewellery shop sipping our teas. Haha! 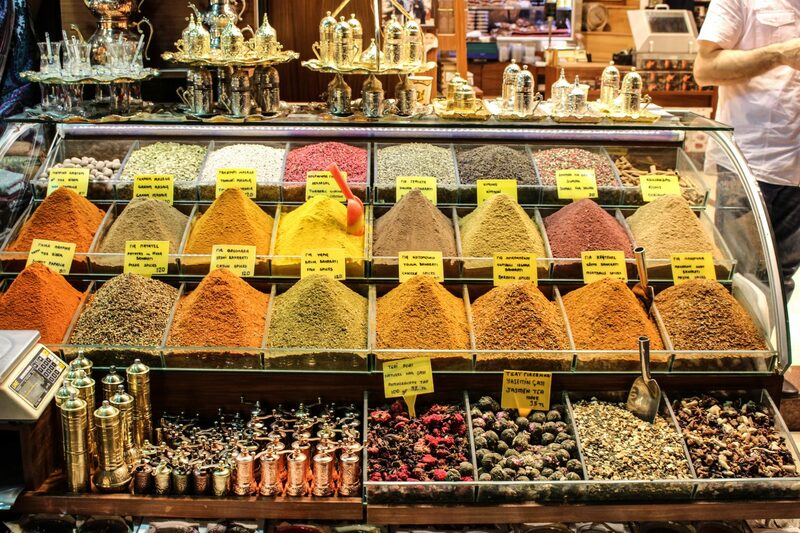 The Spice Bazaar is truly one of the most iconic things to see in Istanbul. 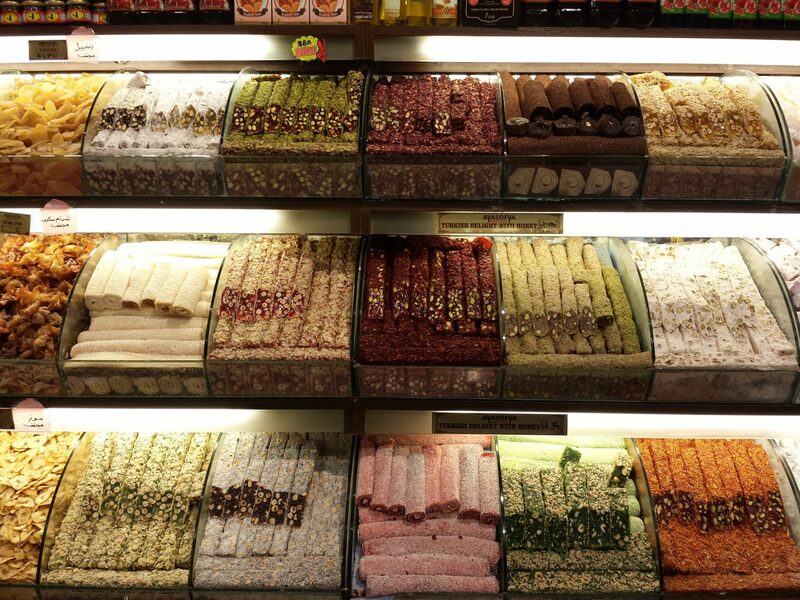 You can find all sorts of spices, Turkish delight treats and different type of tea leaves that Turkey is famous for right in this indoor market! It can be overwhelming, with every stall selling almost the same merchandise. It appears to be increasingly commercialised, as if the reason why the market stands is thanks to the steady stream of tourists looking for local souvenirs. I first heard about the Basilica Cistern while reading Inferno by Dan Brown. In the book, this place is the final destination of Robert Langdon’s quest to find the plague. Langdon described it so well that I can almost imagine the real thing. It got me fascinated at how this “Sunken Palace” can actually exist. This underground cistern consists of marble columns rising from the water level. The cistern is a rectangular structure measuring 140m by 70m. There are 336 columns, each 9m high. There are 12 rows with 28 columns in each row, 4.8m from each other. This helps distribute the ceiling’s weight equally through the columns. The highlight of the Basilica Cistern is the 2 Medusa heads that are used as plinths. They are masterpieces of sculpture art in the Roman Period. There are many myths surrounding Medusa, including the most famous story of how one would be turned into stone if one casts a glance at Medusa into stones. In the Byzantine period, the cistern’s water was used by the imperial palace and residents. The Topkapi Palace is the largest museum in Istanbul, and has a rich history behind it. The palace served as the residence of many Ottoman sultans between the 15th and 19th century. Do avoid wearing shorts, mini-skirts, tank tops, or strapless clothing as there is a sacred relics section that would refuse your entry if you’re not dressed appropriately. 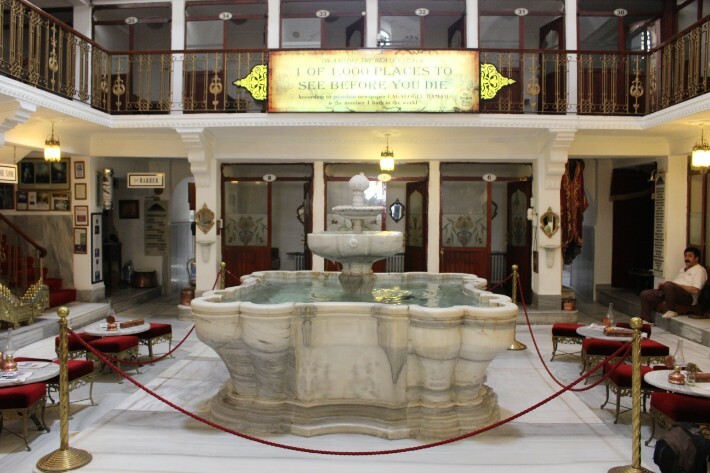 Turkish Baths (hamam) were a public utility in the past because of water shortages. Although most Turkish homes have adequate plumbing today, the baths remain a social institution. Men and Women’s baths are separately housed. The Cagaloglu hamam was constructed in 1741 and is the last hamam to be built after a long period during the Ottoman Empire. I went for a Turkish bath in Cappadocia (more affordable too, I must say). Here’s my experience, if you want to know more. The scrub and massage is done on a marble plinth that occupies the centre of a room. Golden Horn is a major urban waterway and the primary inlet of the Bosphorus in Istanbul, Turkey. Take a cruise down the Bosphorus Strait to take in the sights of this waterway! I caught the sunset here and my oh my, was it breathtaking! 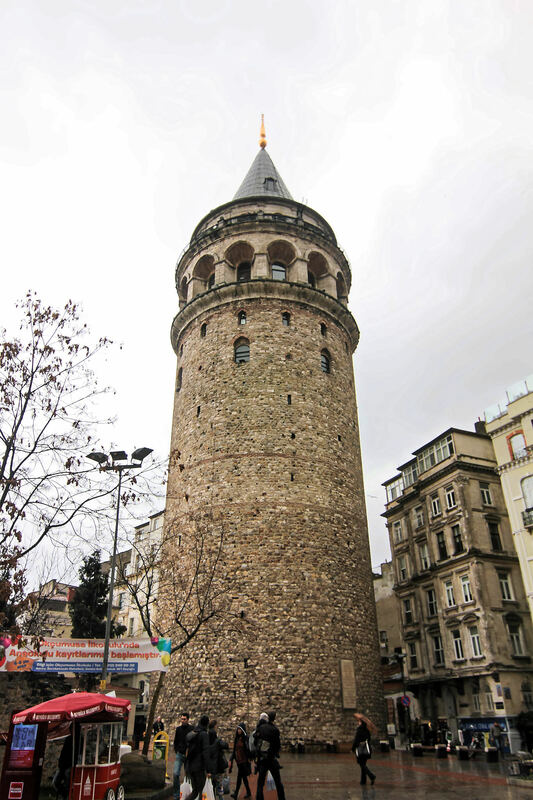 Climb up the Galata Tower for the best views of Istanbul. From the top of the 14th century tower, you can easily pick out features like the grounds of the Topkapi Palace and the Blue Mosque. In fact, it doesn’t involve much climbing as there is an elevator installed in the tower. 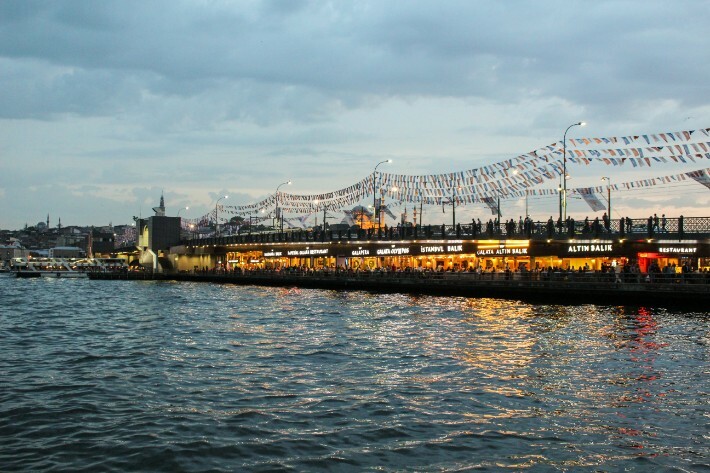 Head over to the Galata Bridge for some of the best seafood in Istanbul. This area is pretty touristy and the restaurants are rather pricey. 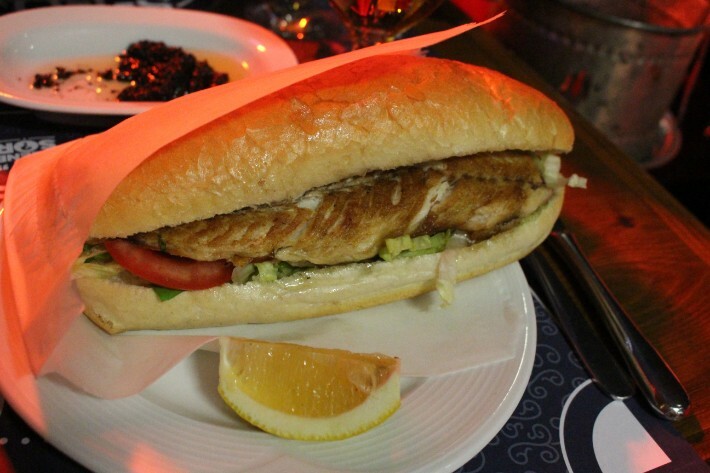 So skip the restaurants and head straight for a fish sandwich. 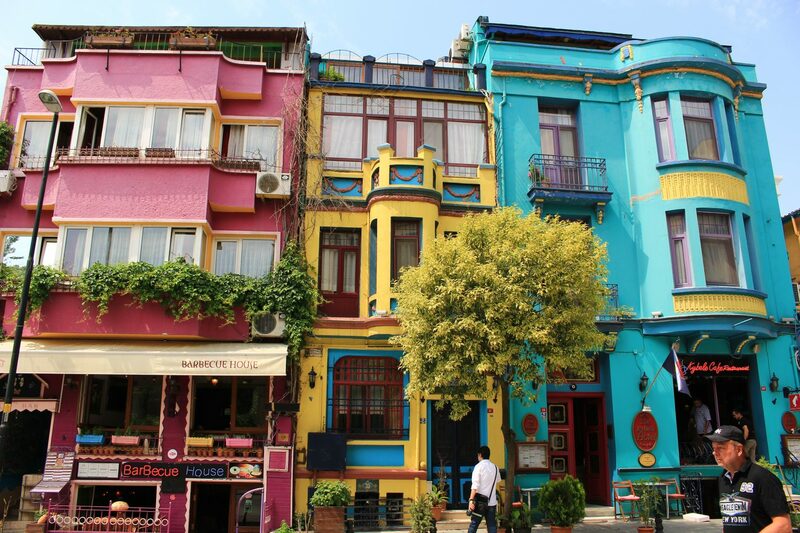 The heart of modern Istanbul, Taksim Square is a shopping district known for its restaurants, shops and hotels. The Independence Monument also stands tall in Taksim Square. It commemorates the fifth anniversary of Turkey’s independence. 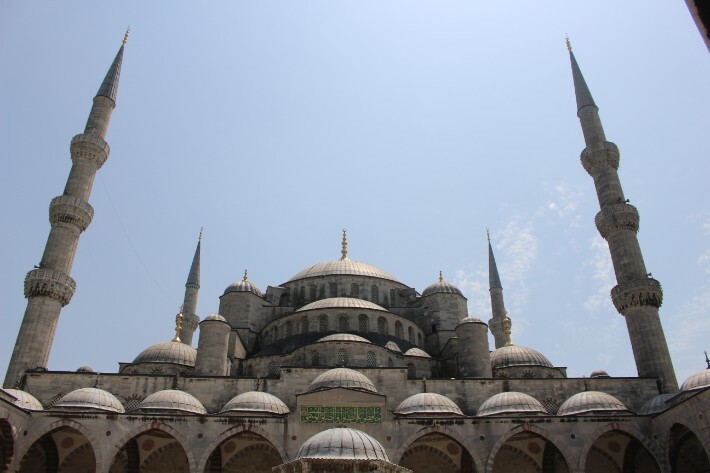 The Suleymaniye Mosque is one of the grandest and most beautiful mosques in Istanbul, Turkey. 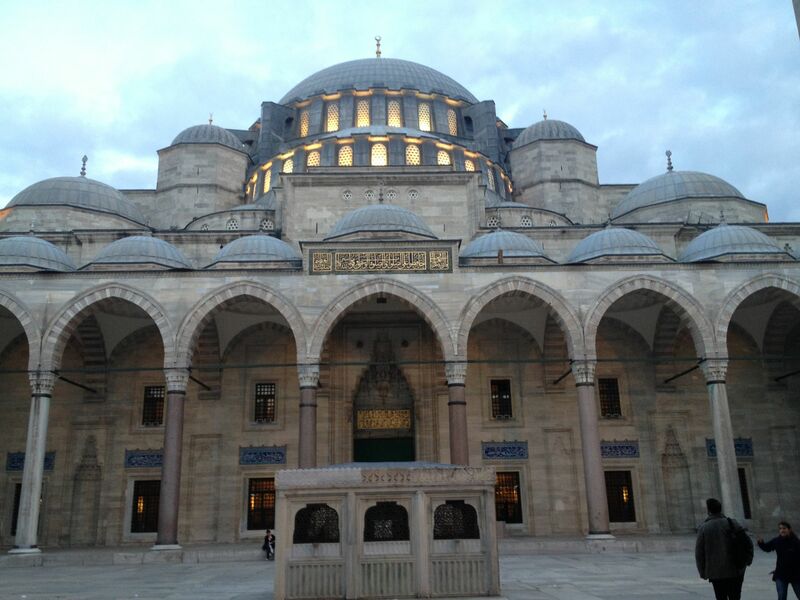 It is also the second largest mosque in Istanbul. The mosque is only a short walking distance from the Grand Bazaar. Went to this food street across Galata bridge, by the river. From the looks of it, it is a wet market at daytime, and converted to a food street at night. Got the grilled fish sandwich drizzled with lemon. Delicious and one of the cheapest foods around! Fish sold here is so fresh. You can see masses of people just sitting on stools and makeshift tables devouring fish kebabs by the river. 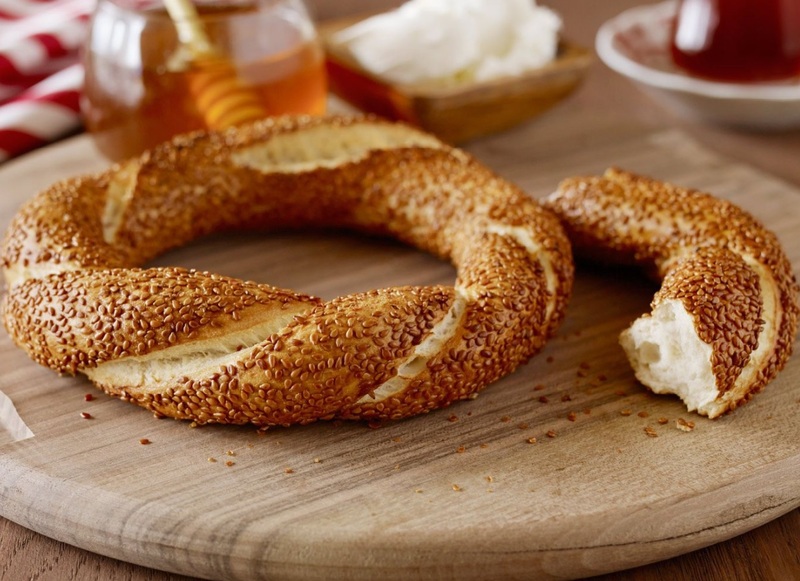 This is the Turkish version of the bagel. It is a bread with a sesame seed crust, a popular breakfast food for the locals. Turkish ice cream has a creamier and stickier consistency as compared to the regular ice cream, and doesn’t melt as quickly! The ice cream vendors would also perform gravity-defying tricks before serving it to the customer. These traditional jellied cubes are the local specialty. Turkish coffee has a foamy texture, and is brewed in a cezve – a special small pot made of copper with a long handle. It is served in a small cup, and usually with a Turkish delight. If you’re not a fan of coffee, go for the apple teas instead. It is little wonder why everyone is enamoured with Istanbul that overspills with things to do, vibrance, history and life. Not only do you see people at every turn, you see an outrageous number of pigeons too! With so many places to visit in Istanbul, I surely couldn’t get enough of the unique confluence between Asian and European culture. I bet you wouldn’t too! Are there any other places I might have missed? Comment below! Good and really informative article. 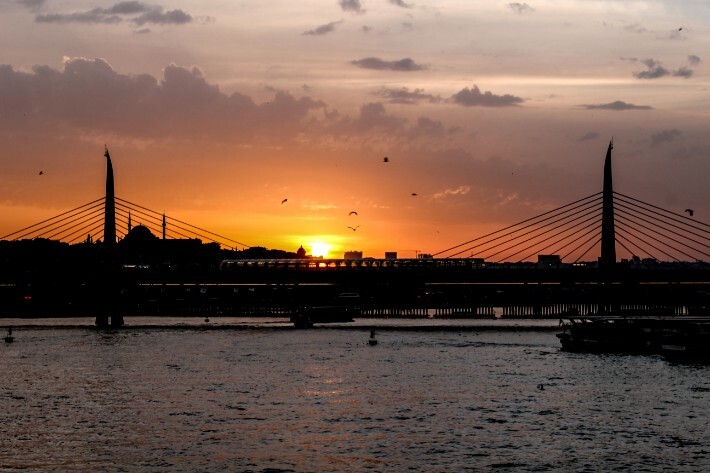 Istanbul is beautiful and very photogenic city. As a photographer I worked on a small video project about Istanbul. Enjoyed 10 days there with all my senses.